Read about my pre-cleanse detox here. Last week was an interesting week. I decided to do a 3 day BluePrint cleanse (which turned into a 5 day cleanse, but more on that later). Always the overachiever, I decided to go with the most intense cleanse - the Excavation cleanse. I'd never done a juice cleanse before so I wasn't sure what to expect. 3 days of all juice? Would I starve? Would I cheat? Would I be miserable? My juice cleanse consisted of 6 juices a day. Green, Green, Green, Spicy Lemonade, Green, and then Cashew Milk. 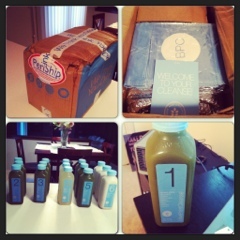 I ordered my 3 day supply directly from BluePrint Cleanse because I figured it would be easier. (sometimes I buy out all the juice at Whole Foods and I didn't want to risk not getting everything I needed.) My least favorite juice was the lemonade. I don't like spicy things, and the heat made the lemonade pretty icky tasting to me. I loved the green juice. (thank goodness, because I had to drink so much of it) And the cashew milk? Amazing! Tasted like a thick, gritty, 300 calorie milkshake. And that's a good thing. Really. I would consider buying these cashew milk drinks in the future to have them as a healthy dessert. The box o-juice came with instructions on how to survive the juice cleanse. (and a nice cooler to cart my juice around in all day) They said to start the day off with hot water with lemon or tea. I don't like either of those things, so...I only did that the first day. The other days I did drink a big glass of warm water. Not sure if that helped or not? Day 3 was kind of a turning point for me. I weighed myself and I was down 6-ish pounds. I felt great, so I decided to keep the cleanse going for two more days, so I went to Whole Foods and picked up some extra juice so I could continue on. I decided to step down a notch and do the Foundation cleanse, which meant I could save a little $ by making my own spicy lemonade (lemon juice, water, cayenne pepper, and agave) and I could swap out one green juice with a Pineapple Apple Mint juice. Because it's awesome and tastes like a tropical "boat" drink, or something you'd have while on vacation. There was nothing really remarkable the next two days. Just more of the same. I lost another pound. My energy level was pretty flat. But overall, I felt pretty good. It was nice to be free from the tummy issues that had been plaguing me for months beforehand. I lost 7 pounds total in 5 days. My weight fluctuated throughout each day. Up two, down two...up one...And it seems like all of the weight I lost came from my mid-section. My stomach is flatter than it's been in...months? I really did this cleanse to feel better, eat better, drink less, etc., but...losing weight was an added bonus! I really loved this whole juicing experience. My body seemed to be really happy with 5 days of clean living. At the end of the cleanse I craved foods like blueberries and kale chips...when a week earlier I wanted wine, pizza, and cheese curds. For the first 5 days after the cleanse you're supposed to slowly reintroduce food into your diet. I've been eating a lot of fruit, fresh veggies, and greens. And I've been drinking more juice. I really hope to be as close to vegan as possible going forward. I always feel much better when I have a limited amount of dairy in my diet. I also plan on limiting my caffeine intake. I haven't had coffee in over a week and I don't even miss it. Another thing I don't miss is booze. Sure, it's nice to have a glass of wine on my back patio...but a bottle water is just as nice. If you have any questions about cleansing, shoot me a message! This was really an amazing experience. If you're feeling run down, etc. and can't seem to find a way to perk up or get your eating habits back on track, I really think 3-5 days of juicing would be a way to quickly improve the way you feel. ****UPDATE*** It's been 10 days since my cleanse ended and I'm still down 7 pounds! And feeling great! Hey, I'm not sure about some of the info you present here, it's more important to be healthy than skinny, which is best acheived by having a healthy lifestyle and eating right. For anybody who wants more info about a healthy 7 day cleanse, then check out this post at http://kosmic-kitchen.com/7-day-cleanse/ There is loads of information in the ebook including menu plans and shopping lists, plus phone and email support to make sure you finish the cleanse and hit your targets. Highly recommended!